Hi guys ! Today, I want to share with you my actual photography gear. If you do photography, you might know that we always want more and more and more stuff about photography. It's a kind of syndrom you know, a camera gear obsession. Whatever ! this post won't help you to calm down because maybe I will give you some new obsessions. BUT right now, here are my stuff (come back in 6 months and it will probably have changed again). I took this picture with my iPhone. All my cameras and accessories are here. I have 3 digital cameras : my olympus omd em 5 mark ii with 3 lenses (20 mm, 45 mm and 40-150 mm), my Canon G7X Mark ii and my new Canon 80D with a 24 mm lens. I have 7 analog cameras : Canon AE-1 Program, Canon A1, Nikon Fe (from my dad), Minolta Weathermatic (from my dad), my fujifilm instax, 1 mju and an Olympus O-product (not on the picture). 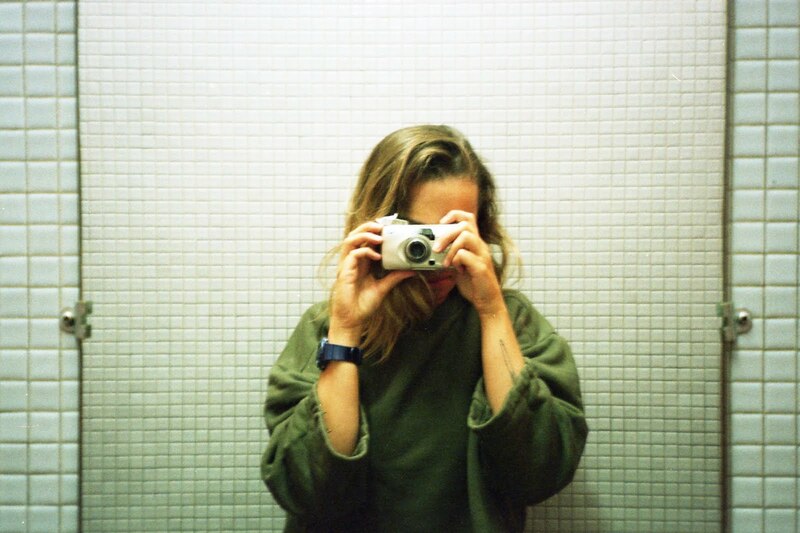 I actually don't use the Canon A1, the Minolta and the O-product. Because, no idea. For the rest, it's all accessories. I use everything a lot. As you can see, I have films, battery chargers for my three digital cameras (only two on the picture because I forgot one during my holiday, crap!). I have stuff to clean my cameras (I use it mainly for my analog cameras and my scanner). And I bought recently for my last trip a CPL polarizing filter from Gobe (for my 80D 24 mm lens). I think I'll do a blog post about this little baby. What's really important to me ? Extra batteries and extra memory cards are the basics for me ! When you start to shoot daily and in different places (with or without electricity and computer), you must have the necessary with you. And this is SO IMPORTANT. I know it's expensive, especially if like me you don't buy "generic" extra batteries. 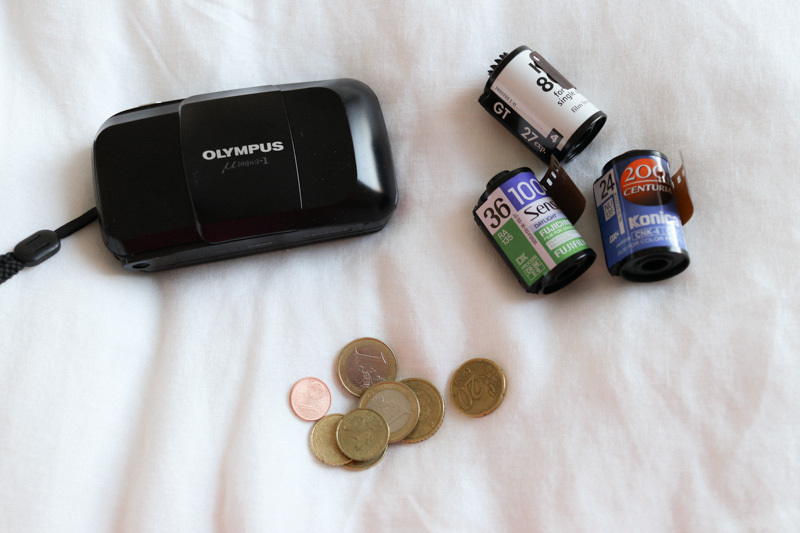 Mine are Canon and Olympus (for my Canon and my Olympus cameras, I don't have an extra battery for my 80D because it makes the job for now) (extra battery for my Olympus is not on the picture because I forgot it during my holiday, crap again!). Nothing play on nerves like carrying a camera, witnessing good things to shoot but you can't make it since the battery is doing, you know how it feels right ? And it's the same about analog photography. I have some extra batteries, just in case. I used to have different camera bags but this one is the best : my Fjallraven Kanken with a special photo insert (not available anymore, the brand created a new one, more expensive). Really usefull, because I can bring all my stuff with me. 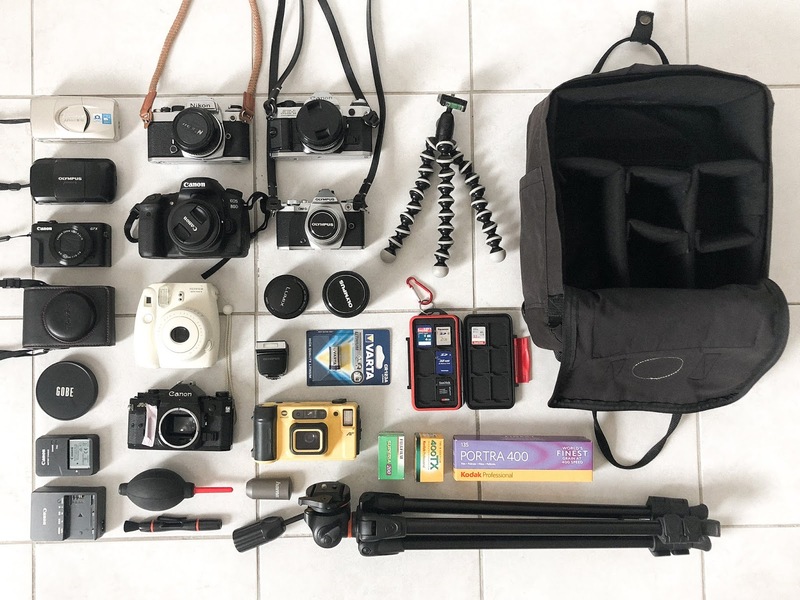 When I only take one or two cameras (generally I bring with me daily one analog and one digital camera), I put them in my daily bag and that's it. I love them both. They are perfect and very easy to use. The gorilla pod is really usefull for vlogging or when I took pictures of stuff on a table. The other one is a Vanguard. Really cool, really tough. I use it mostly to film video too or to take pictures of myself for my other blog. What do you think about all my stuff ? Do we have some cameras or lenses in common ? Which one do you want or is your favorite ? Let me know, I'm so curious !